I really doubt that this is working. It might kind of work somehow... There is only one German Rundschau with the correct solution. Carpettailors don't need a two piece collar. Please stop this "only Germans know how to do things" rubbish once and for all! Nobody cares! I'm glad that somebody took the time to share this instead of only bashing the methods of other tailors! If you know better, not just tell, show us! There are plenty of ways to make this work, I'm sure this has been tried and tested! And there is more than 1 solution for a 2-piece collar! One of the other solutions would be to draft the stand differently, meaning that it would follow the curve of the front neck hole to the opposite direction to make the upper collar brake just above the stand..
try again ,if you can . I have a post dealing with this on my blog. I was making early 19th century coats but I think the basic idea and technique behind it is similar to what I would do on a modern suit collar. I would post it in full here if I had some time. Edited by Terri, 09 October 2012 - 07:40 AM. I'm glad this topic came up. I'm eager to learn more about the two-piece top collar. Your blog post was very informative, thanks Terri. Unfortunately SG actually has the only one correct Rundschau of 1975 at hand. And the Rundschau is G E R M A N. So what can we do about it. Could you not publish an English way then, if you hate your German tailoring way? I call that hypocrisy! (GSB) Denn also spricht der Hohe und Erhabene, der ewig wohnt und dessen Name heilig ist: In der Höhe und im Heiligtum wohne ich und bei dem, welcher eines zerschlagenen und gedemütigten Geistes ist, auf daß ich belebe den Geist der Gedemütigten und das Herz der Zerschlagenen erquicke. (KJV) For thus saith the high and lofty One that inhabiteth eternity, whose name is Holy; I dwell in the high and holy place, with him also that is of a contrite and humble spirit, to revive the spirit of the humble, and to revive the heart of the contrite ones. But actually SG is cheating on you he published only the complicated draft way, which is the same like 1 page before but with a lot of German text to translate and he don’t like to break the copyright laws as it would close the forum. Still the draft brings the same result but is very, very different than what daristi ideas are. 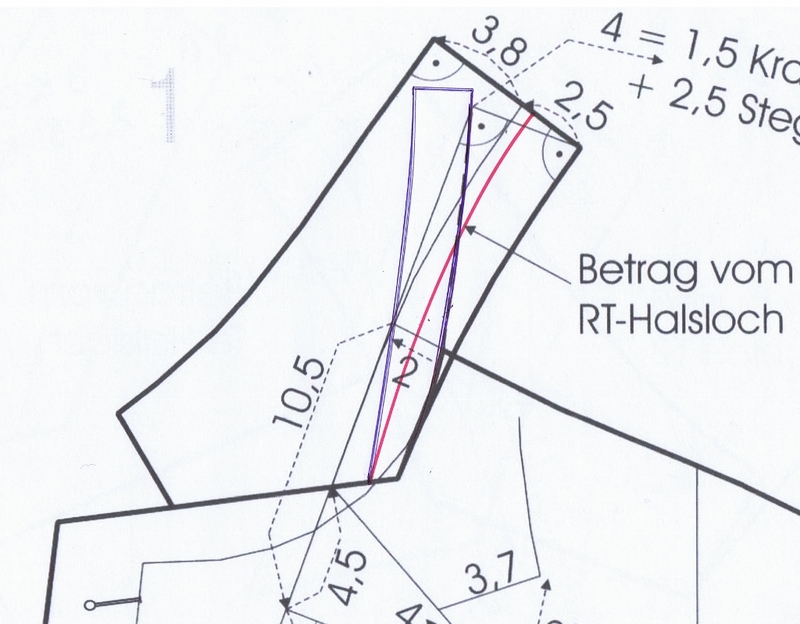 But I assume you: The G E R M A N Rundschau draft works, if you understand the logical idea behind it. But actually I wouldn't do it like that. I prefer a more logical way of developing the stand out of a regular collar. Once you made one pattern you can use it over and over. It's just rude and shows a narrow mind! Unlike daristi, others and me, you haven't shown any solution and just provided unnecessary comments (am I the only one who sees a pattern here?). I'm sure there is a passage I could cite from the old testament or an edition of the Watchtower, but to be honest, I haven't read any of those. Unfortunately I do not have time for to provide a translation of the notes. Carpettailors? What the F* is a carpettailor? 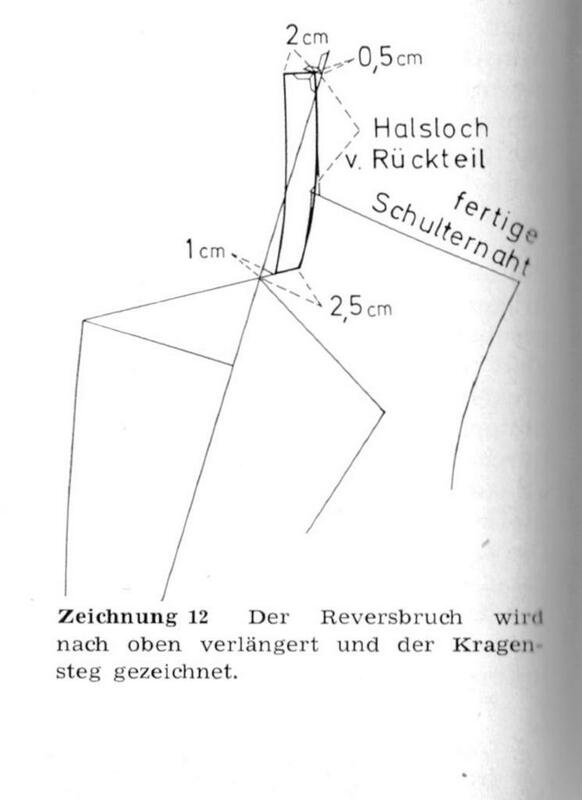 Halsloch v. Rückteil means "length of the rear neck hole"! Torry, thanks for sharing. From when are those pages? It is very difficult to find drafts for 2-piece collars before 1970. Der Zuschneider, why do you insist on shooting yourself in the foot? Two piece collars have probably been around for centuries in one form or another. I think most tailors think that they are not worth the time for most cases. Anyway, what it boils down to is what effect one wants, so that German one really does not explain much. are ever changing and were each stuck to a certain time zone, so wouldn't know what other fashion demands existed. I first saw the 2-piece collar in women's wear cutting manual, surprisingly one for dresses. They don't show it in the latest Müller & Sohn coats and overcoats book. The version Terri shows on her blog is also used for fur collars, where they just piece the upper collar and sew the parts together in a way you may not notice it's made from several pieces. The main purpose is actually to be able to work with hard and/ or high twisted materials that don't allow much or even any shaping. 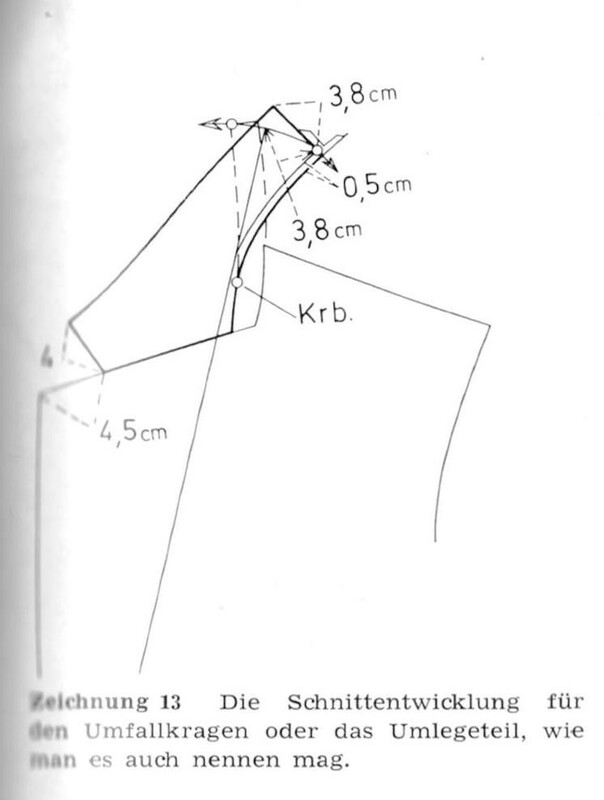 Once you have a good basic shape for the under collar it's probably faster to use the system shown in Zeichnung 1 to 3 to get a good fitting collar than to rely on stretching the material alone. The main purpose is ... to work with hard ... materials that don't allow much or even any shaping. It is. But, consider that it is also a way to control precisely how much shaping is given to the topcollar. Instead of "breaking" the topcollar with an additional process and then letting someone else determine how to make it lay down, smoothly, all these engineering constraints are worked out at the pattern bench. There are a dozen ways to draft this. My preference is the slashing method that Terri uses. The method she adopted produces the most consistent results and can be taught and perfected in the shortest amount of time. Also bear in mind that several of us don't draft the collar or the sleeves until after the body is fitted, styled and perfected. Those of us who do "work ahead" know how to trace our discrepancies, systematically.